300 Years of British Silver: Hallmarks of the Monarchies presents flatware and other silver dating back to the reign of William III and Mary II (1689-1702). This comprehensive and chronological collection includes silver from the time period of each British monarch from William and Mary to today’s Queen Elizabeth II. Included in the exhibition is a wide array of items, including flatware, teapots, salvers, and commemorative pieces, which exemplify the diversity of British silver. 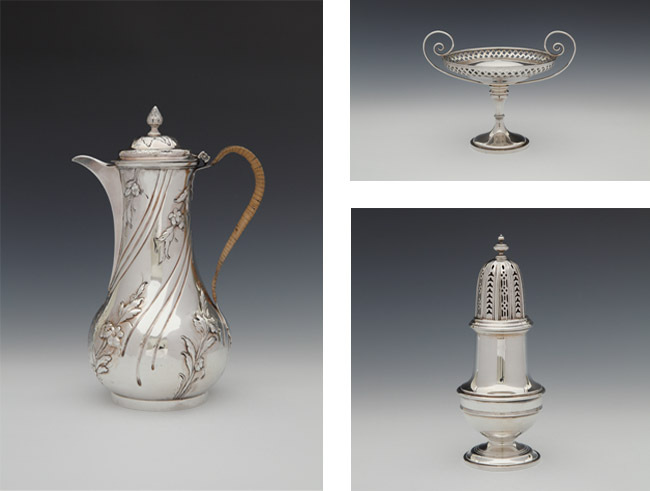 This selection from the past 300 years demonstrates how British silver was used for any variety of items, thus providing historical and cultural context. They also serve to highlight the process of silver manufacturing, taxing, and distribution, specifically the importance of hallmarks. Hallmarks play a crucial role in identifying silver and the British system of hallmarking has been in place since the 13th century. Hallmarks can include such information as the date and city of manufacture, as well as indicate special occasions or time periods, and most importantly, give information about the maker and attest to the quality of the material.